Saab Magalona looks back at first days as a mom: "It was a dark time." Saab Magalona looks back at her early days of motherhood: "It was a dark time for me because without seeing or touching our boy, all I could focus on was the loss of our daughter." 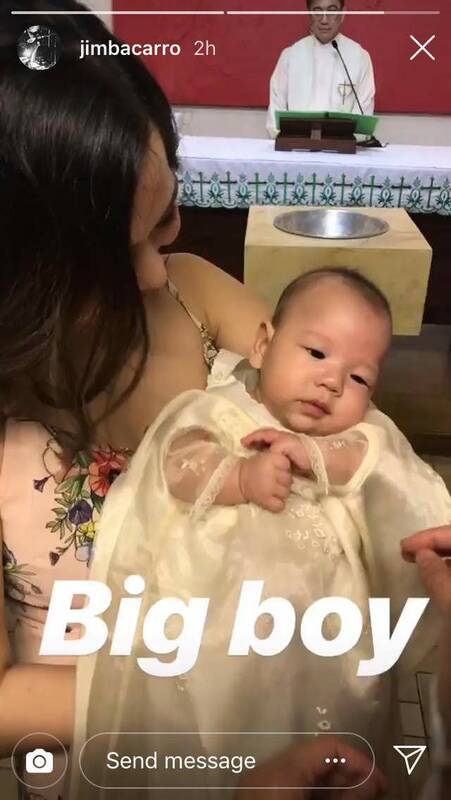 Saab Magalona and Jim Bacarro's five-month-old son Pancho is getting baptized today, July 14. As they celebrate this milestone, Saab finds herself looking back at her journey so far and shares her insights about her early days as a new parent. On her latest Instagram post, the musician-blogger revealed that she was on her 30th week of pregnancy when she had to undergo an emergency C-section. "Our baby girl's heartbeat had stopped," Saab wrote in her post. "Our baby boy survived but I did not see him for 6 days [because] I was in and out of the ICU myself (it’s a long story)." Their daughter Luna passed away on February 8. Saab broke her silence over the loss of her daughter on March 6 through an emotional blog post. Their son Pancho was immediately brought to the Neonatal Intensive Care Unit then, and Saab was disheartened that she couldn't be by her baby's side. She continued on her Instagram post, "I felt so many emotions when I was told I could leave my room to see my child. "Prior to that, all I could do was ask Jim to show me videos and photos of him. "It was a dark time for me because without seeing or touching our boy, all I could focus on was the loss of our daughter. "Honestly, at the time, I just kept thinking our baby boy would not make it either especially with the initial tests they did on him." We are alive today because you kept us going. You are the strength of this family. I was given a second chance at life and what a life it is to have you right beside us. Happy Father’s Day, my love ?? Then on February 14, Valentine's Day, Saab was finally given the go-signal to see her son for the first time after giving birth to him. "I cried. I was so happy but I was also so scared. "I washed my face, put on some lip and cheek tint and brushed my hair. "It was like a first date and I wanted to look pretty for my son. "As I saw his sweet tiny body in his bed, barely moving, I was overjoyed. "Jim told me he wasn’t moving at all during the first few days so his tiny movements were more than enough for us. "It dawned on me that aside from Valentine’s Day, it was also Ash Wednesday, the first day of Lent. "Somehow, I felt God was telling me to keep praying and not to lose faith. "Today, Pancho will be baptized and I couldn’t be more proud of how far we’ve come as a family. "I know Luna will also be with us as we celebrate this milestone (hearts emoji) (this photo was taken on Feb 14, 2018)"
After almost three months in the hospital, Saab and Jim finally brought Pancho home on April 4.